Don’t undervalue what you do, says badass Joyce J. Scott. Published on Friday, March 16, 2018. This article appears in the February/March 2018 issue of American Craft Magazine. Joyce J. Scott, right, sits with Louise David, a descendant of Harriet Tubman, at the October opening of “Joyce J. Scott: Harriet Tubman and Other Truths” at Grounds for Sculpture in New Jersey. I got the news that I’d won the MacArthur Fellowship when I was suffering from acute sciatica, so the only place I could actually sleep was at my desk. The phone rang; they said they were the MacArthur people. I didn’t believe it. I said, “Prove it.” I’d just won another wonderful, local award, and I thought it was my friends calling, just giving me a hard time. But it wasn’t. I also wondered if it would change people’s expectations. It’s an international award, so that ups the ante. 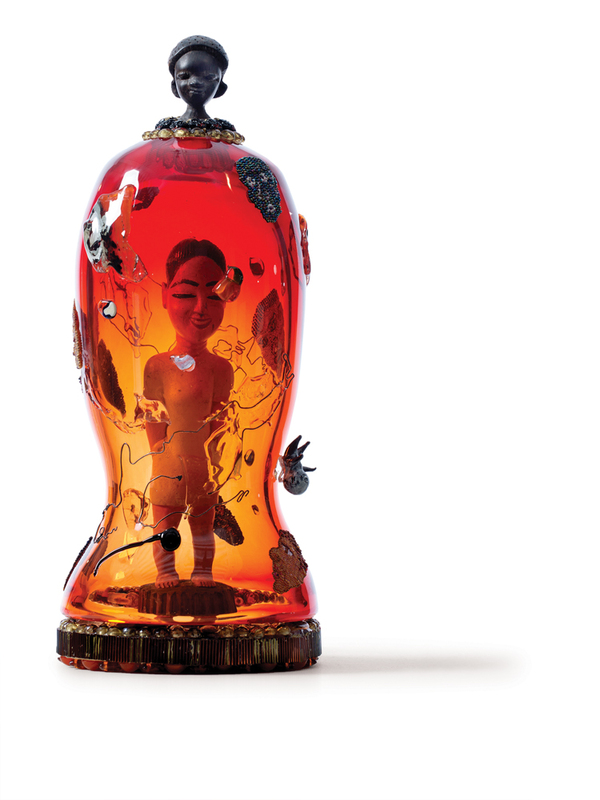 But luckily, I’ve always been a hard worker – like James Brown, only in the art world. It hasn’t changed my work, though, because I’m badass, and I always have been. I never needed money to make good art before. But it will help my career trajectory. It validates what I’ve been doing. You have to be nominated and vetted, and sometimes it takes years. So to get it, and to know they’ve invested that much money in you, that’s a big deal; that’s a big celebration. It allows me to be an art godmother. I can take some young artists to dinner, the way people always included me when I was young and didn’t have money. This is also retirement money. It’s important to realize that even though you may not have a 401(k) or a regular salary and direct deposit, you are working a “real job” – for yourself. It truly is an honest day’s work. I didn’t get it by going to Las Vegas and hitting the slots. I got it by making the artwork, and that is definitely akin to those folks who were picking cotton or anything else. There’s no “advice” you can follow to be awarded a MacArthur, of course. I just always did what’s always worked for me as an artist, which is to stay the course and be the best – creating a road while I was walking on it. Because why else am I alive? This is the only life I know I’m going to have as a human. If there is reincarnation, I’ll probably come back as a toenail or snot or something. So this time, I have to live and work as a human. I’m off to do my best, I’m off to create artwork that makes a difference for everyone. That’s why I encourage artists, no matter what’s thrown in their way, to just keep making art, even if it’s on the weekend, and to be as inventive as you can be. This is it, y’all; this is the real thing. To know that your life and your career as an artist is the real thing – there’s nothing better. 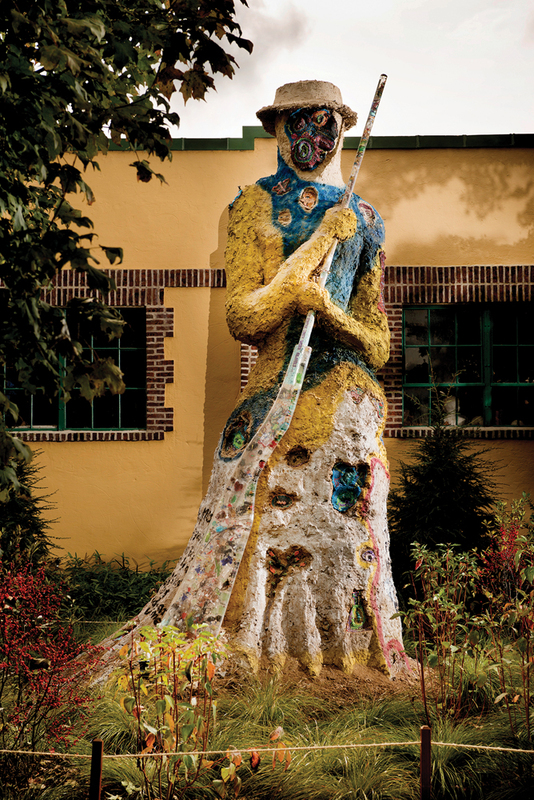 “Joyce J. Scott: Harriet Tubman and Other Truths” runs through April 1 at Grounds for Sculpture, Hamilton, New Jersey. At 15 feet, Graffiti Harriet (2017) is the tallest sculpture Scott has made. She built the piece with soil, clay, and straw, embedded beads and found objects into it, and added graffiti to the surface. It’s intended to decompose over time and fall to the ground. 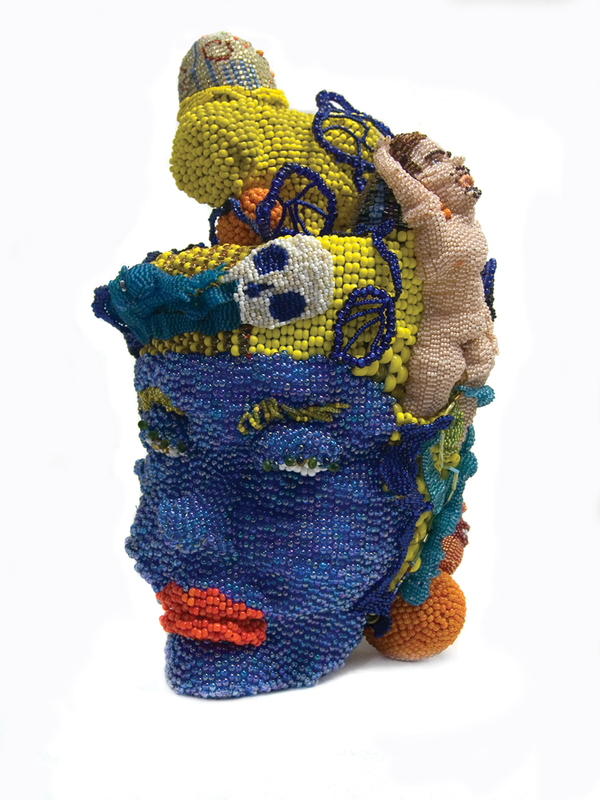 This untitled piece of hand-stitched glass beads plays with scale and color, a signature Scott approach. 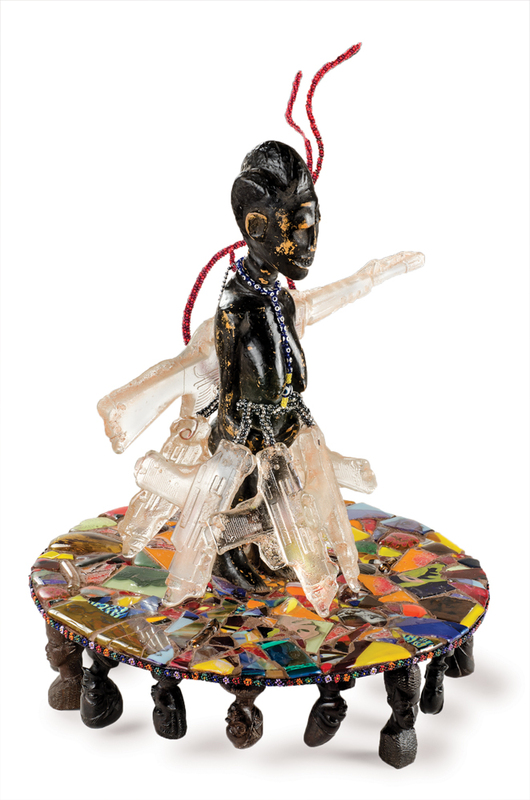 War Woman II, 2014, African sculpture, mosaic glass, glass beads, plastic beads, thread, wire, metal keys, cast-glass guns, 25 x 18 x 18 in. Someone’s Been Bleachin’, 2017, hand-blown Murano glass, beads, thread, 21 x 8 x 8 in. Even Scott’s jewelry pieces, such as Family of Blues (2014), have a sculptural quality.